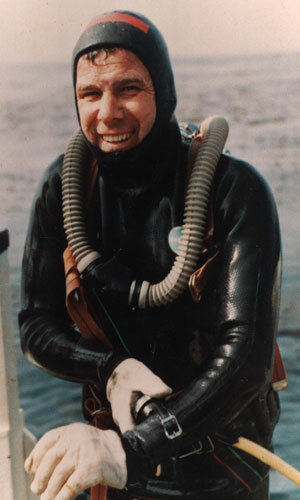 With heavy hearts the Meistrell family is sad to announce the passing of Bob Meistrell, waterman, adventurer and the co-founder of Body Glove International and Dive N' Surf Inc. He had a wonderful life, and would have been 85 next month. He lived his motto of "Do what you love, love what you do." until his last day when he was on his boat, The Disappearance. He was coming back from Catalina as the lead boat in the Rock 2 Rock Paddleboard Race. During the race, The Disappearance had a double engine failure which Bob said has never happened before. 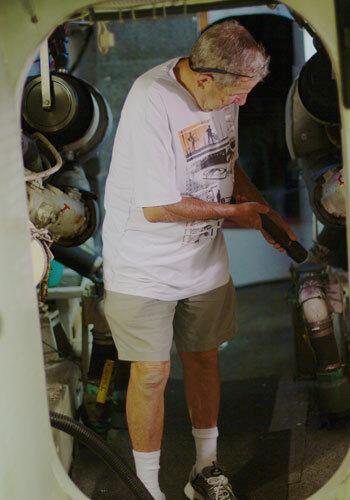 Bob, attempting to get the boat up and running again, hurried to the engine room where he suffered a heart attack. His nephew, Steven Lockhart, began administering CPR and called for son Robbie and nephew Billy Meistrell, who were on nearby boats to assist in his resuscitation. When the Baywatch Isthmus arrived, they moved the unresponsive Meistrell up to the boat’s deck and attempted to restart his heart with a defibrillator. After nearly two hours of trying to revive him, Bob Meistrell was pronounced dead. 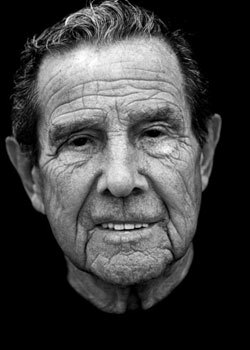 Bob and his twin brother Bill, who passed away in 2006, helped to create the "Surf Culture," which changed the world, beginning with their designing, manufacturing and selling of the first commercially viable neoprene wetsuits. 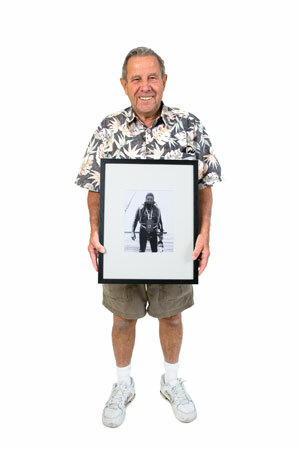 Bob and Bill are two of only three watermen to be inducted into the Surfers and Divers Hall of Fame. This year Body Glove International celebrates its 60 Year Anniversary, and Bob and Bill's presence will be deeply missed. Even though they are gone, their stories and adventures will live on in a book "Fits Like a Glove" that will be released this Fall. Bob and his brother Bill, will always be remembered as true waterman, honest businessmen, loving fathers, and overall legends. Bob leaves behind his sons Robbie, Ronnie and Randy, nine grandchildren, Tracey, Matt, Jamie, Nick, Kenna, Robert, Randi, Rhoni and Makayla and two great-grandchildren Mia and Maddox. He also leaves behind his wife Patty of 62 years. As Bob always said, “To have a happy marriage, you first need to find a good gal, and second she has to be able to put up with you.” There’s no question Bob and Patty spent every moment of their lives deeply in love with one another. Further information about memorial services will be posted at a later time. 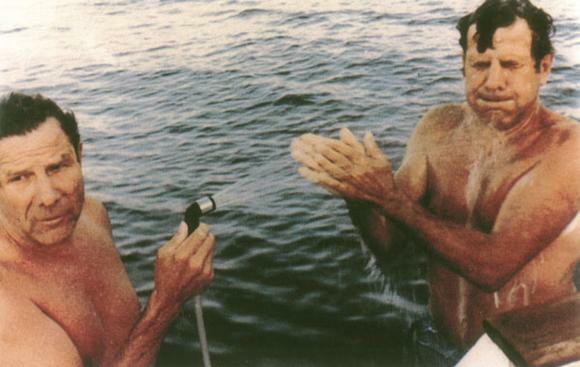 Both Bob and Bill were very involved in protecting the ocean since the 1950's. Bob was also extremely passionate about doing trips on The Disappearance to raise money for the Switzer Center. In lieu of sending flowers, we kindly ask you make a donation to one of these three organizations. Saturday afternoon while driving their zodiac to the Isthmus, Patty in a lighthearted mood looked to Bob and asked, "Do you love me?" Bob said "I've loved you for the last 62 years." 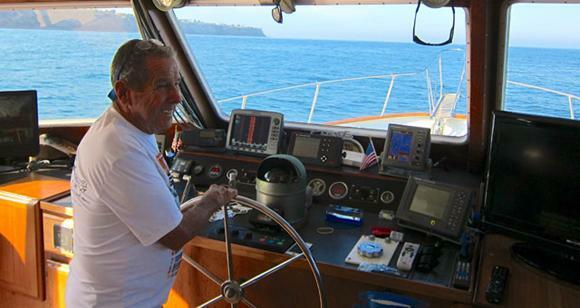 A normal day for Bob Meistrell cruising around the Palos Verdes coast. Bob spraying Bill with the hose on the back of the Disappearance on a trip to Catalina. 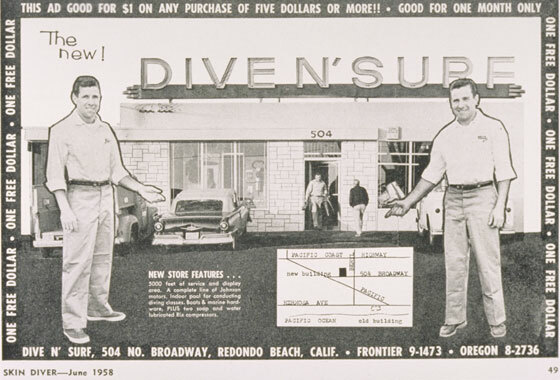 Bob and Bill standing in front of the newly re-opened Dive N' Surf in 1958. Bob and Bill a part of the LA County Lifeguards in the late 1940's. This picture is being turned into a bronze statue by Chris Barella and will be unveiled at our 60 Year celebration in September. 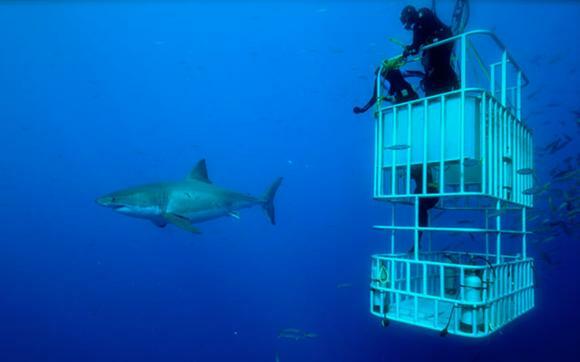 Bob Meistrell cage diving with Great White sharks off Guadalupe Island at the age of 81. 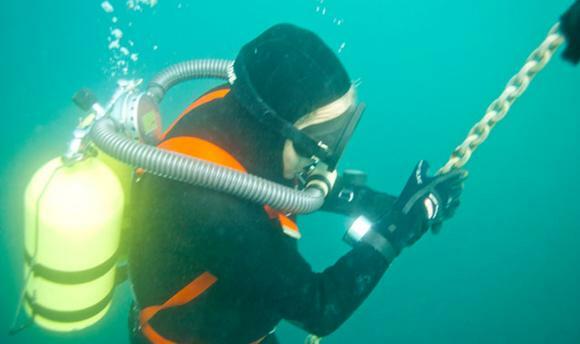 Bob was part of the first Dive Instructor's class called the Underwater Instructors Certification Course. 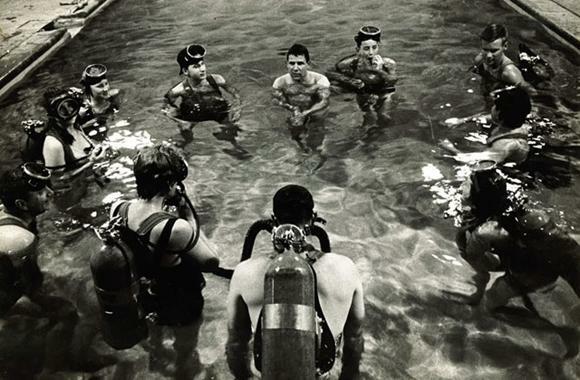 Here Bob is teaching a class in the 1950's at Dive N' Surf. Bob Meistrell holding a picture of his late twin brother Bill Meistrell. Bob Meistrell diving twice his age to 162 feet for his 81st birthday. 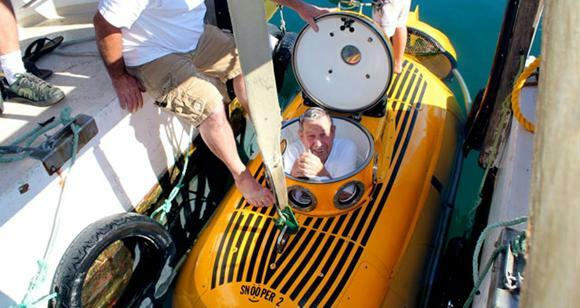 Bob Meistrell diving in his Submarine for his 83rd birthday. Bob was always proud to show people the engine room of The Disappearance. To him this was his second office. This photo was taken earlier this year at Emerald Cove in Catalina. Bob has a closet full of wetsuits on The Disappearance from the last 60 years. 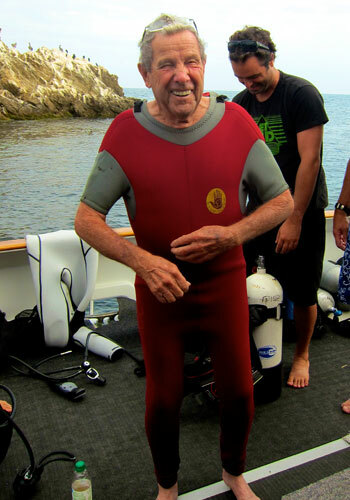 Always a jokester Bob wanted to try on one of his older wetsuits during a photoshoot. 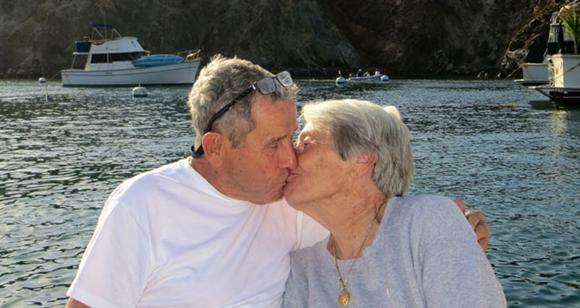 Two days ago Bob and Patty shared a kiss while driving back to Cherry Cove.